I’ve never thought about visiting Saint Petersburg until I studied it at school in World Destination class. 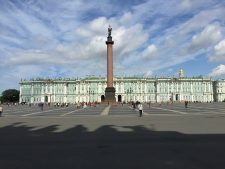 When I read about its unique churches and that the Hermitage Museum is one of the most important museums of the world I immediately became fascinated with this city. In addition, the fact that the city was beautifully designed mainly by French and Italian architects enticed me to visit it. I landed in Saint Petersburg after a 1h20min flight from Moscow. From the airport buses depart very often, connects to the subway line, and it is a very short and cheap ride, less than US$1. Moskovskaya is an old and quite intriguing station with thick walls and you only see the train when it arrives and the cast iron door opens. From there I headed to the hotel located near the main avenue Nevsky Prospekt, which is wide and very busy, full of stores, restaurants, hotels and beautiful buildings. After the check-in and lunch I took a bus to the Hermitage Museum. The bus went straight down Nevsky Avenue and as I walked to the museum I could see a big and impressive arch to access Palace Square, where the museum is located. 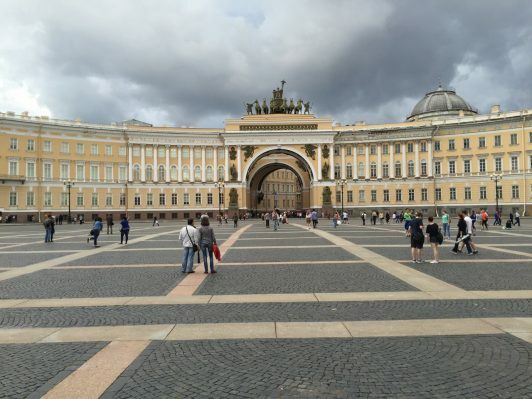 Palace Square is very huge and one of the most important squares in Saint Petersburg. In the middle of it is Alexander Column, a single monolith of red granite topped with an angel holding a cross, almost 4m high and represents the Russian military victory against Napoleon. On one side stands The Winter Palace (The Main Museum complex) a monumental baroque style building, and on the other side The General Staff Building (also part of the Hermitage Museum) united by an arch to some government buildings. 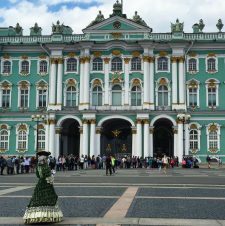 The Hermitage Museum is important because there are over 3 million works of art, but in addition, the palace is gorgeous! Actually I loved the building itself more than the art collection. 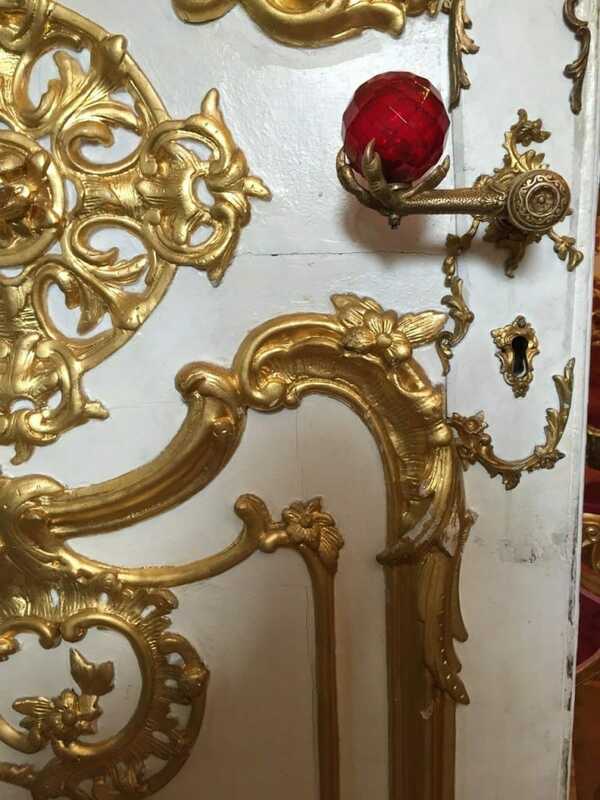 Every room is different, full of details with elaborate wood and marble floors, imaginative door handles, designed furniture, flaring chandeliers and candelabrums, majestic columns and doors and painted ceilings with divine motives. I was in awe and felt like a child visiting a museum for the first time. The inspiration for some of the rooms comes from Versailles, Ancient Greece, and the Vatican Palace. Every step I made and every room I visited, I was enthralled. 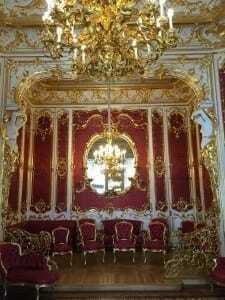 One of my favorite rooms was an altar in Rococo style adorned by statues sparkling with gold leaf, with handcrafted angel images also covered with gold, gilded moldings, paintings and a lovely geometric wood floor. I saw important works of art from renowned artists such as Leonardo da Vinci and Michelangelo in a world-class museum, yet for me the building itself is a masterpiece. 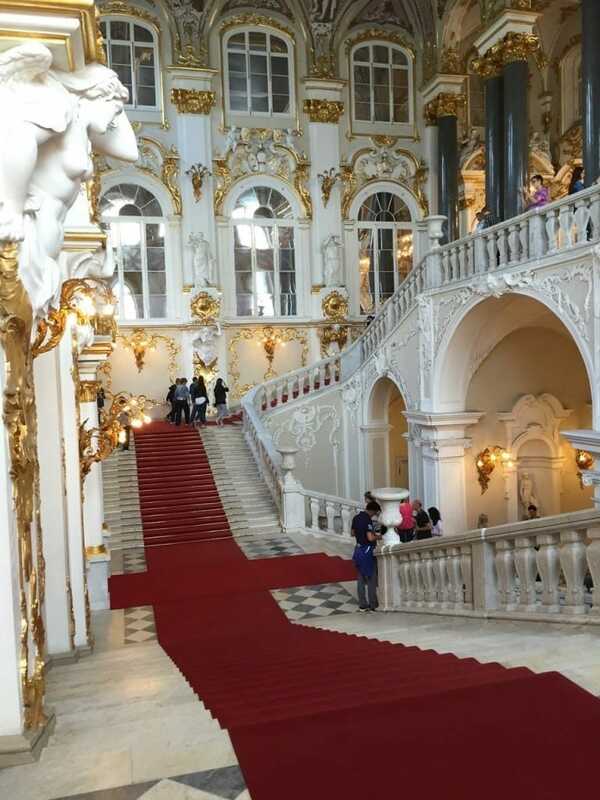 I left the Winter Palace overwhelmed by its beauty and decided to wander around the city and walk back to the hotel. The sun was setting and from the main avenue I could see the sky changing colors and I could admire the European architectural beauty and influence in Saint Petersburg. My second day in Saint Petersburg started with a free walking tour with the meeting point the Alexander Column. 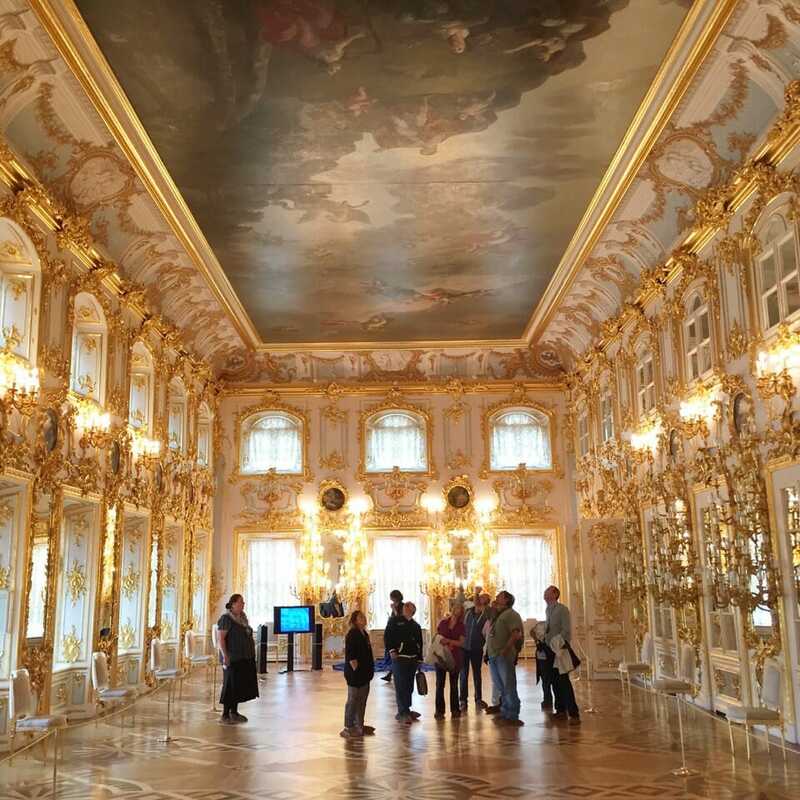 The walking tour was very helpful and we passed by important historical points of the city such as Saint Isaac’s Cathedral, Admiralty, The Winter Palace, and learned about its legendary personas such as Peter and Catherine the Great. After the walking tour I headed for one of the most iconic churches that I wanted to visit: The Church of Savior on the Spilled Blood. 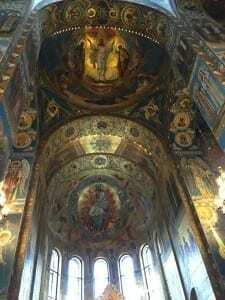 The church actually has become a museum since 1970; it was fully restored and re-opened in 1997 and it is located exactly where Alexander II (a Russian tsar) was fatally wounded on March 1st, 1881. It is a fine example of a Russian style church designed by Alfred Parlan. The outside of the museum is just spectacular!! The façade is very colorful made of red and brown brick, richly decorated with glaze tiles with fine workmanship, and has five central onion domes with gilded crosses on the top of it. I was astonished and very curious to get inside. 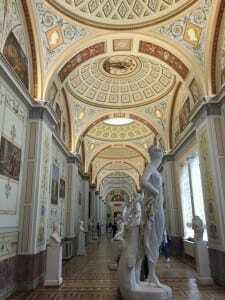 If I was amazed with the façade, when I entered the museum and I saw its interior I was mesmerized and speechless. 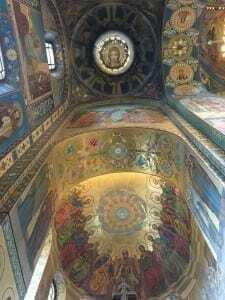 Over 7500 square meters of mosaic link Alexander II’s murder with the crucifixion and covers all walls, columns and ceiling. 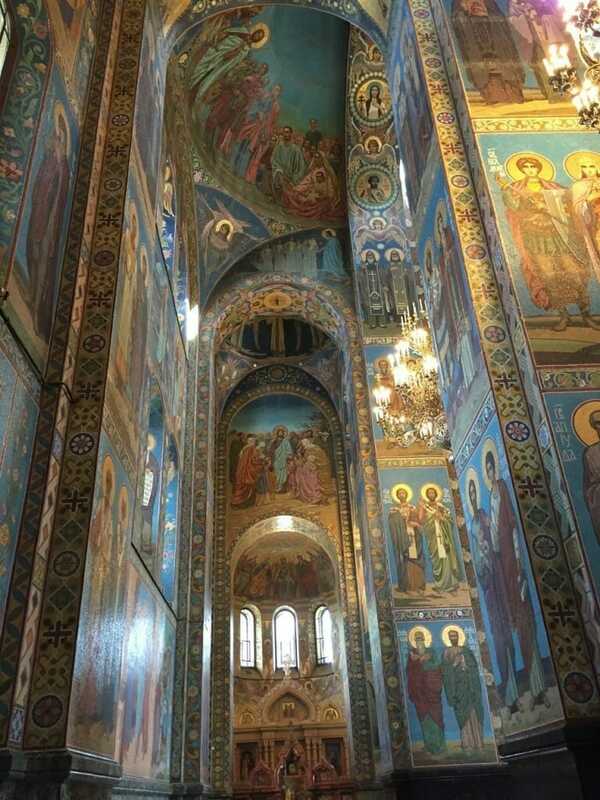 I have never seen anything like this before… Actually the Church of Savior on Spilled Blood has the second largest mosaic collection in the world. 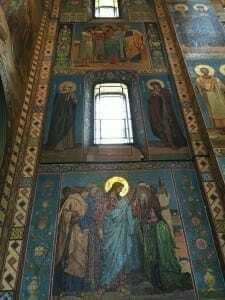 The mosaics are extremely beautiful, colorful, with a blue predominance and a modernist style like a Byzantine painting. I was fascinated by the vivid gold halos in some images shining bright and reflecting the sunlight coming through the windows. 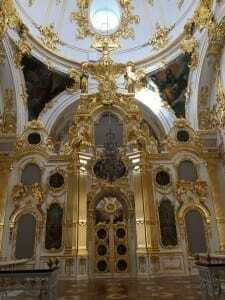 The walls and vaults represent scenes from the Nativity to the Assumption of Christ. 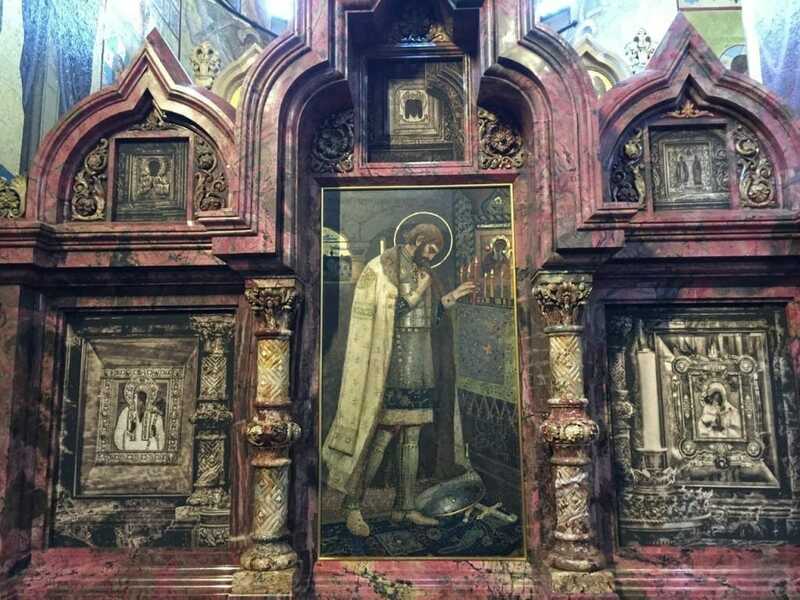 There are over 600 icons, including Russian saints, martyrs and apostles. The most profound things for me were the altar with a magnificent image of Christ and also another image of Christ at the highest point of the church overlooking everything… My neck began to hurt because I was staring at those two images so long. I was in awe and my eyes were sparkling! 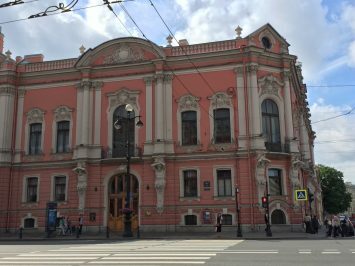 There is also impressive stonework in the memory of Alexander II, columns made of grey-violet jasper from the Ural and Altai regions. 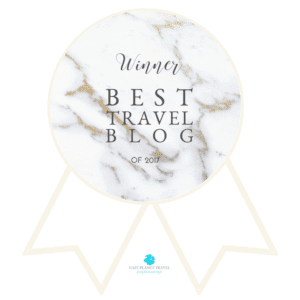 Actually there is marble from Norway, Germany and Russia as well, executed by skillful craftsmen creating intricate stonecutting art, such as the stunning floor with 45 mosaic patterns that never repeat themselves. I don’t know how much time I spent visiting the museum, but when I was about to leave I decided to linger as much as I could and make sure that I saw every detail and corner of this otherworldly place. 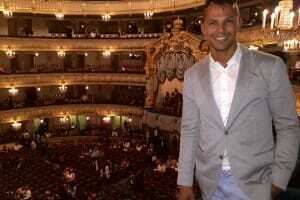 That evening I saw an opera at Mariinsky Opera Theater another Saint Petersburg landmark building. 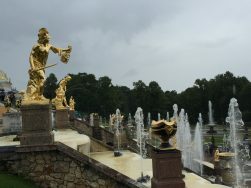 The Grand Cascade runs from the northern façade of the palace through the Marine Canal to the sea. The vista of the fountains with the palace behind it is breathtaking! Unfortunately the weather that day was not good and I wondered how it would be with blue sky and the sun shining… After wandering around the huge garden, I took the steps to enter the palace and saw the fountains from another perspective and also could see the Marine Canal all the way to the sea. After the visit I had lunch in the food court outside of the Grand Palace and headed back to the city. 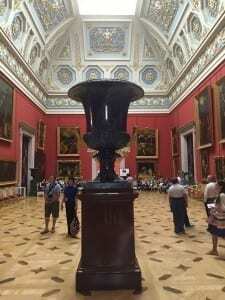 In addition to the main tourist spots in Saint Petersburg, I had also visited Saint Isaac’s Cathedral, Peter and Paul Fortress, Kazan Cathedral and taken a boat ride through Saint Petersburg canals. 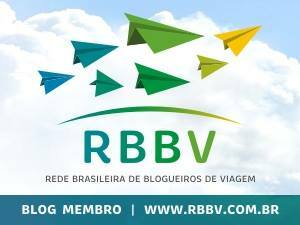 ∗ By plane: there is an international airport located 23 km (15 mi) from the city. Pulkovo International Airport receives flights from Moscow, Helsinki, Seoul, Zagreb, Beijing, Tel Aviv, Berlin, Prague and many other cities. Some of the companies that fly to this airport are: Aeroflot and Rossiya (Russian companies) , SAS, Air Baltic, Air France, Turkish Airlines, Emirates, KLM and Lufthansa. The city bus number 39, 39A and “marshrutka” minibus number K39 run between the nearest Moskovskaya metro station and the airport. ∗ By train: there are daily departures from Moscow to Saint Petersburg and the fastest train takes around 3h and 30 minutes. Saps operates those trains and offer different options and the cheapest train can take around 9h. There are also trains departing form Helsinki with Allegro. ∗ By bus: there are also buses from / to Tallin and Helsinki with the company Lux Express leaving from St Petersburg Baltic Station. This is definitely the cheapest way. 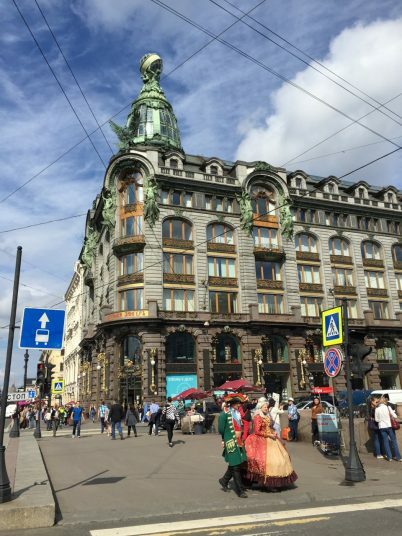 The best time to visit Saint Petersburg is during the summer. From late May to early July nights are bright in St Petersburg, but the real White Nights ( when the sun does not descend below the horizon enough for the sky to grow dark) normally last from June 11 to July 2, and there is a big festival in the city at this time. 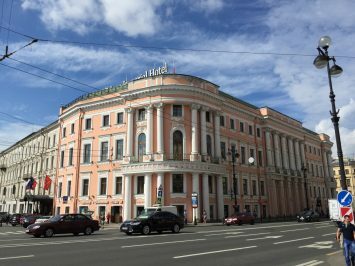 I stayed at Aventlnn Hotel, close to Nevsky Prospekt Avenue. 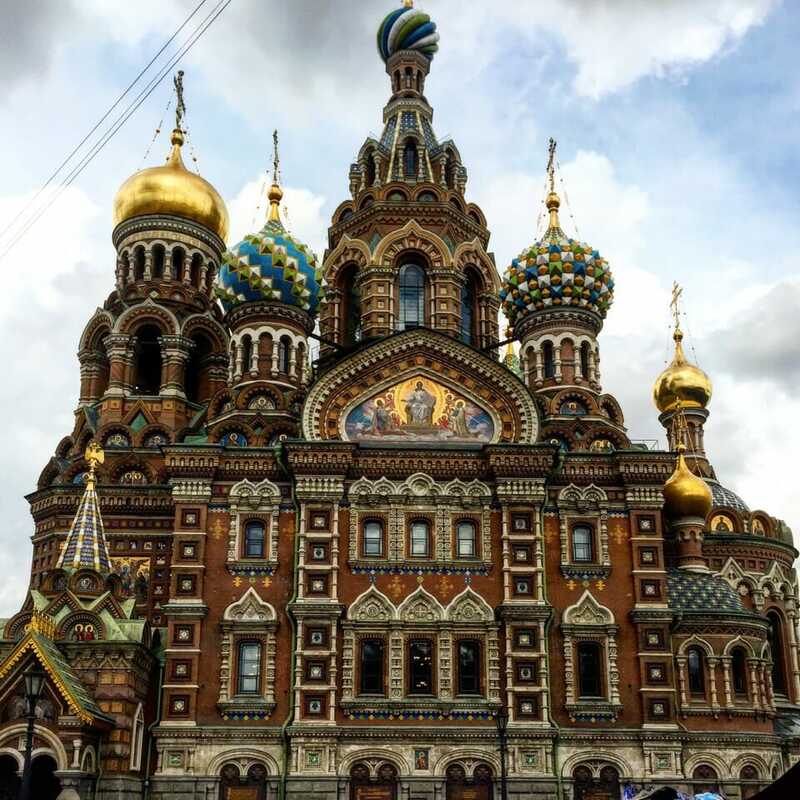 ∗ Flight Moscow to Saint Petersburg with Transaero: US$ 53. ∗ Three nights at AventInn Hotel: US$ 90, with breakfast included. 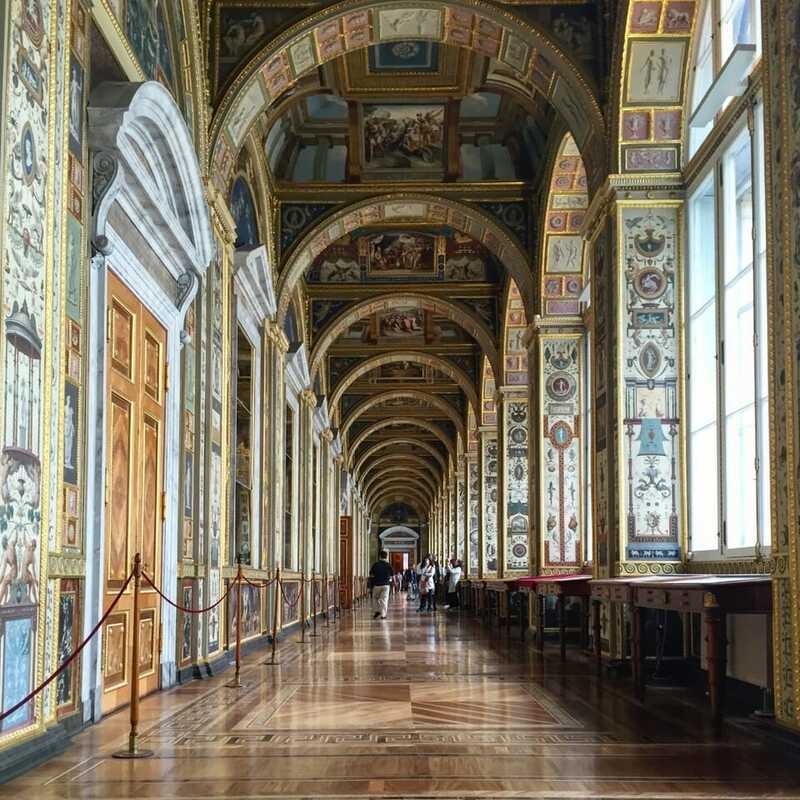 ∗ Hermitage Museum ticket: 600 RUB (US$ 10). But there are also cheaper tickets and it is the first Thursday of each month. 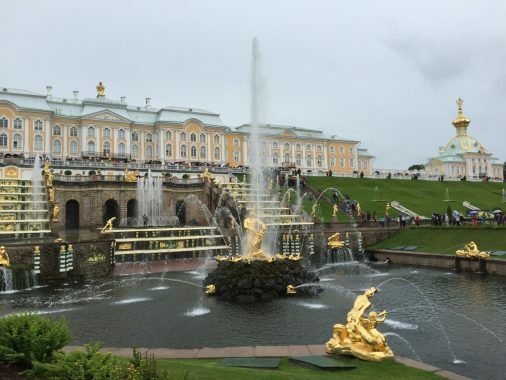 ∗ Peterhof Palace: Lower Park and Fountains: 500 RUB (US$ 8) ; Grand Palace: 600 RUB (US$ 10). 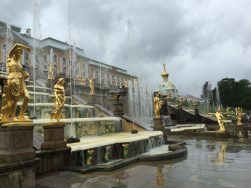 ∗ Free Walking tour Saint Petersburg: PetersburgFreeTour. ∗ This post was converted into an app, and you can get it clicking here.